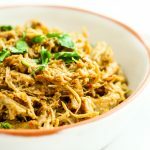 This crockpot Thai chicken recipe is perfectly spiced and incredibly tender. The chicken can be used for tacos, sandwiches, lettuce wraps, and more! Is it already that time of year? Am I really going to send you a crockpot recipe right now while it’s still summer? Yes, yes I am. Depending on where you live, we might as well start planning ahead and saving some crockpot gold to our Pinterest boards, right? Here in Colorado, the mornings and nights are starting to cool off. And to me, that means it’s time to bust out the crockpot. For soups and chilis and stews, obviously. But more importantly, for this tender, juicy, melt-in-your-mouth Thai chicken situation. With just a few simple ingredients and a couple hours of patience (that’s the hard part), dinner is on the table and we are all happy campers. The only things that you might not have on hand would be lemongrass paste and green curry paste – both of which are available at almost any grocery store! And both of which are useful for plenty of other recipes, too – such as these Thai peanut sweet potato noodles. But I digress. Enough about ingredients. Let’s talk about the end result instead. The end result being you, chilling on the couch, re-watching Game of Thrones (?) with a full belly and a clean kitchen. Because crockpot recipes are the bomb. And mayyyyybbeee you’re also feeling like a boss because you know you have leftovers to eat for lunch tomorrow? 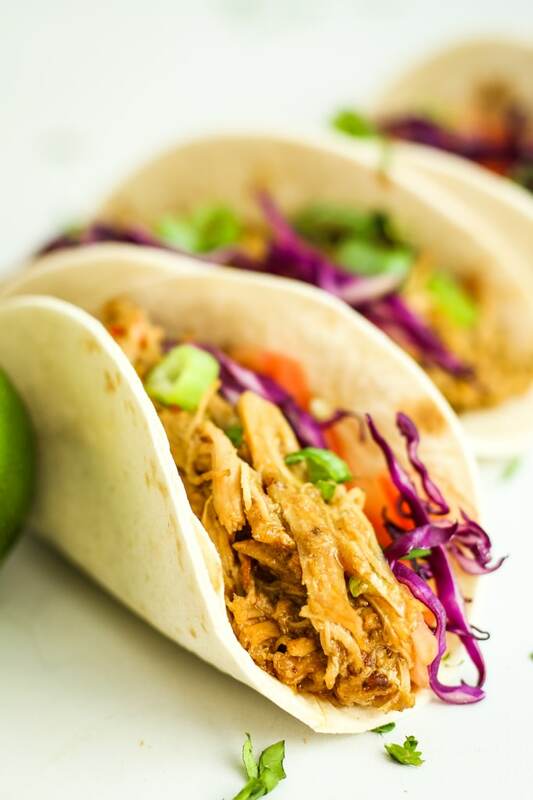 PS – This recipe was originally intended to be straight up Thai chicken tacos. But then I thought to myself, “who am I to tell this chicken what it has to be?” Sure, it makes a pretty phenomenal taco filling. But it can be eaten straight up. Or over rice and steamed veggies. Or in sandwich form. Or even in lettuce wraps. Whatever your prerogative with this chicken, just go make it. And tell me how much you love it! 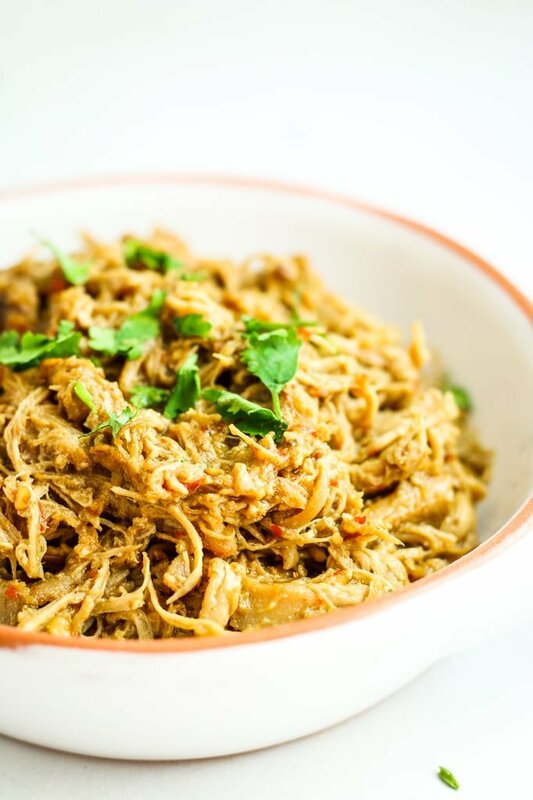 This easy crockpot Thai chicken recipe is perfectly spiced and incredibly tender. The chicken can be used for tacos, sandwiches, lettuce wraps, and more! Place chicken thighs into the crockpot. Combine other ingredients in a large bowl and whisk together to combine. Pour into the crockpot. Cook on low heat for 2 hours. Remove chicken thighs, saving the liquid from the crockpot if desired. Shred the chicken. Serve on tortillas, in sandwiches, or over rice! Yummmmm! Good substitution – I’m sure it still tasted fantastic. Love the idea of serving over veggie noodles! Would the leftovers be alright frozen and then thawed a couple weeks later? Not sure with shredded chicken. I would think this would freeze just fine! I can’t say for sure because I haven’t tested it, but if you do, please let us know! I made this tonight and served over a baked sweet potato. So incredibly good with lots of flavor! The sweet potato gave just the right amount of sweet to offset the spice of the curry. I mixed chicken thighs and breasts, so had to increase cook time. Cooked on low for 3 hours and turned up to high for an additional hour. I’m definitely keeping this recipe around and highly recommend! Oooooh excellent idea with the sweet potato – I bet the flavors paired perfectly! I’m so glad you enjoyed. :) Thanks for commenting! I loved this recipe! Will definitely make again. Is it possible to do with a pork roast? I’m so glad you liked it! I’ve never tried this recipe using a pork roast before so I couldn’t say for sure. If you try, be sure to let us know how it went! The recipe just said chicken thighs, not boneless. I bought it with bones, but I just noticed in the comments you said boneless. Can I use bone in? Will it change how long I should cook it? Newer crock pots cook at higher temps than older ones. It’s messing up the cooking times for people. All my old recipes need way less time and many with thicker sauces burn on the sides of the pot. No longer can you set it up and leave the house, they now need to be watched. Definitely true. It seems like all crockpots cook a little differently. I’m super excited to try this! Has anyone tried it with chicken breasts instead? I haven’t tried with chicken breasts yet! Let me know how it works! I made with skinless/boneless chicken breast and the chicken was a little rubbery and hard to shred but it was still yUMMY!!! I also used low fat coconut milk bc that was what I had in my pantry. Will make again! Also I was worried about the 2h on low but it cooked all the way through. Hi! Bone in or bone out on the chicken thighs? I really want to make this tonight, but could not find lemongrass paste in my local store? Would doubling up on the green curry paste be a good alternative? Or do you have another suggestion? You can leave out the lemongrass paste! It does add a nice note to the flavor, but it’s still delicious without! 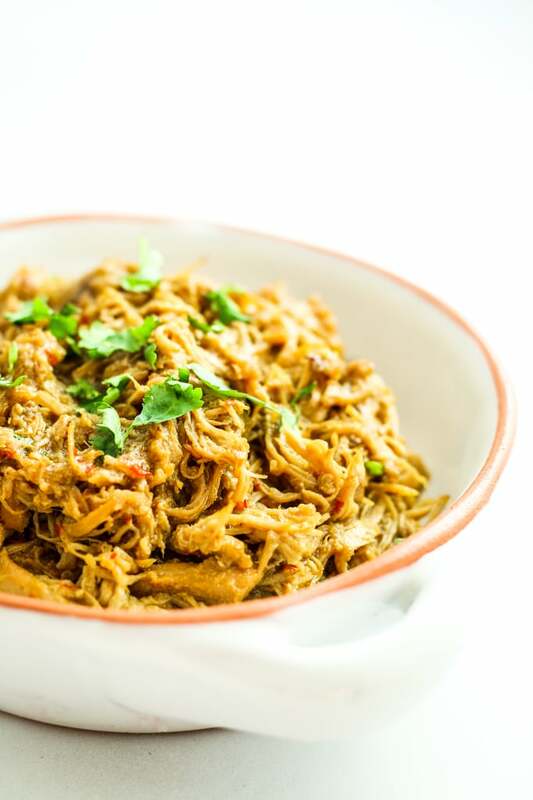 Do you mix the shredded chicken back in with the sauce? You certainly can mix the chicken back in with the sauce! I find that it winds up too juicy and messy that way so I just store the shredded chicken. I save the sauce for adding to the chicken if necessary – for example, I’ll sometimes reheat the chicken on the stovetop for a sandwich and add a bit of sauce to rehydrate. Not sure why the cooking time was only 2 hours. Didn’t look remotely done enough at 2 hours. I left it in the crock pot on low all day – about 8 hours. We put it in lettuce boats with jasmine rice. 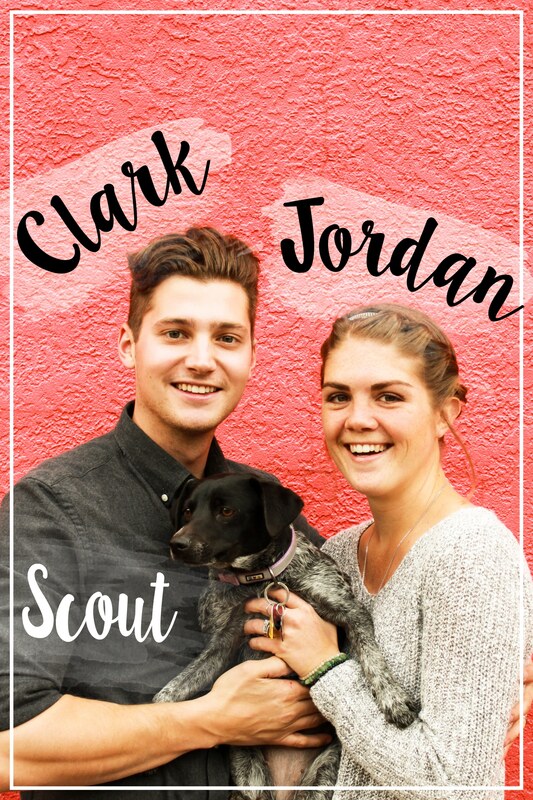 Got rave reviews here! Thanks. 2 hours on low? That sounds very unlikely. A previous commenter said it was definitely not enough. Maybe that should be 2 hours on high? Even that doesn’t sound likely. Any clarification on this? We cooked for 2 hours on low. Perhaps more time would be necessary if the chicken thighs were super large or if the recipe was doubled. But as it stands, it took 2 hours on low to cook throughout. What are the nutrional contents of this recipe? Hi Greta! I’ve just updated the recipe with nutritional info. The recipe makes about 6-8 servings. Thanks!